In recent years, Topps hasn't really spent the time to find great images. In fact, too often you see the same image appear on cards from the same year, or in consecutive years. True, they have done this in the past, but maybe we are more fickle in our live now than the previous generation. Topps also used to have their own crew of cameramen out there. I'm sure for the Heritage and other releases where portrait shots are used, you have a group hired by Topps head out for the photos. But otherwise, a bit of searching through AP Images or Getty Images will turn up the photo used on a card. And many of those are great images. It just, in the task of turning the picture into a trading card, something inevitably gets lost. Sometimes, the New York office gets it right. 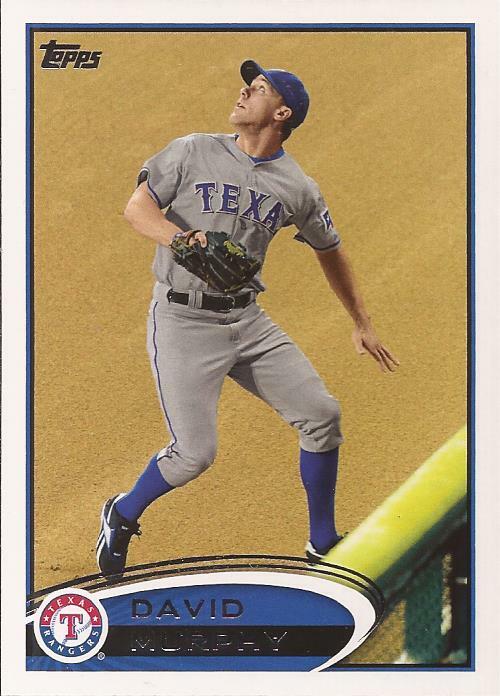 This is a fantastic card of David Murphy. The clean, raked lines of the track. The hint of green and yellow with the rapidly approaching wall. The center framing of Murphy as he tracks the flight and is about to raise his glove to make the catch (I assume). I've noticed recently that too much is spent by Topps making sure the player's face is the center of the card. Fortunately, the cropping is just right on this and creates an excellent piece of cardboard. By leaving in that bit of wall, not only are we, the viewer, not lost on the context of the action, but the wall balances the Topps badging on the left side of the card. Journey. You either love them or you hate them. Growing up, my best friend Paul loved them. He had every cassette (and a couple 8 tracks I believe) of all their albums, so we listened to them a lot - as he had a car, and Chaz and I did not. But that's ok, because when you get past "Faithfully", Lovin', Touchin' Squeezin'" or "Open Arms", you can find some great tracks. Early stuff with Gregg Rollie lead singing on "Play Some Music", adding Steve Perry with "Where Were You" and "Feeling That Way" to the overused, but still good, "Don't Stop Believing". That last song comes from their top selling album Escape, and that sucker is great from the first track to the end. But hidden among chart topping songs "Don't Stop Believing", "Who's Crying Now", "Open Arms" and "Stone In Love" is track 8 - Dead Or Alive. Neal Schon is an under appreciated guitar god. Every so often, a Journey song gives him the opportunity to show off his skills, but Dead Or Alive allows us to really hear his talent. Escape is definitely on my deserted island take a long list. Stone in love and Mother, Father are definite highlights. Stone in Love- love Neal's playing on that song. 2012 Topps actually had some great photos...it's just that damn surfboard design got in the way a lot of the time. Let's not forget what a great drummer Steve Smith is. Just rejoined the band actually.